Pawsitively Stamps: What happened to Stampin' Up! convention posts? What happened to Stampin' Up! convention posts? Oops! Yeah, my bad. You see, I was having so much fun making swaps each night (late each night) that I completely goofed on actually posting what was happening at convention. The bottom line... it was loads of fun. This was my first convention in the 3 years I've been a Stampin' Up! demo. Wowza. Mind you, I go to semi-local RS conventions all the time. But Stampin' Up! convention is like no other. Imagine ~6000 demonstrators gathering in one spot all for the love of rubber. I spent 2+ hours in line for Momento Mall the first day with my good buddy and fellow demo, Kathy D. Neither of us had swaps to share, but it really didn't matter. We had so much fun watching others swap, checking out other demo's swaps, and meeting wonderful people. I even got to hook up with my upline Sherry and my sideline Judy (and many other great folks in my demo family!) Although I missed the last day of general session (where a UPS truck drove onto stage and men in brown jumped out and hand delivered a rubber stamp set to each demo in the audience! ), I am so happy to be fortunate enough to attend this year's SU convention. Really! My goal each night was to make 10 cards to swap the following day. Kathy helped me each night (and laughed at me, rightfully so) while the card stock was flying, ribbon tied, eyelets set... you get the idea. Good thing I brought my card making supplies. I was able to take new sets we received in our goodie bag and use them for swaps. Moving along, here's one of the cards I made for class at the end of August. If you haven't signed up yet, do so ASAP. Space is limited and I want to make sure you get your spot. 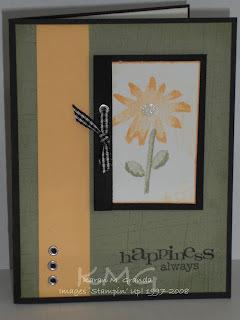 I will try to post a few more samples of cards before class (August 30th at The Crafter's Studio.) Call or email to reserve your spot. *Ask about my bring a friend special discount! * Also note- sentiments on most card can be changed to meet your needs. Although I show samples of certain sentiments, you will have others to choose from. This is a way I can help you individualize cards for your current needs. :-). Those colors are so great together. What a beautiful card! I should have bought this stamp set when the demo's had the opportunity to purchase the hostess sets.